Sasha Adams has it all. Fulfilling career, loving family, great friends, and… Who’s she kidding? She lives at home with her aging mother, Fleur. She works as a massage therapist, and spends all her time with her best friend, Bobbi. But damn it, she’s happy. Well, okay, maybe not happy, but she’s content. It’s enough. Until the well-meaning but meddlesome women in her life, Fleur and Bobbi, team up and enter Sasha into a writing competition with the potential to change her life. Film producer and director Jac Kensington has the career she’s spent thirty years honing to perfection, with little thought to her personal life. She helps run an annual scriptwriting competition in search of new talent and projects for her company to produce. Meddling might have brought Jac and Sasha together, but fate has plans of its own. Sasha’s life is on the brink of changing beyond all recognition in this bittersweet lesbian romantic comedy. This book made me laugh, cry, and feel an array of emotions throughout. Andrea Bramhall is a great story teller with a writing style and story that engaged me from the beginning. Sasha and Jac have a chemistry that made me want to follow their adventure through to the end. A great supporting cast of characters – Bobby, Fleur and Jac’s workmates / friends make the story stronger and add more laughs and back story along the way. I would definetly recommend this book. I will be looking for more stories from this author in the future. I received an arc in exchange for an honest review. This is the only word that left my mouth once I flipped the last page, still drying the tears that were slowly running down my eyes. I was sincerely Lost for Words. Lost for Words is the story of Sasha Adams and Jac Kensington. Sasha is a bright woman, who works harder than she should as a massage therapist while taking care of her mom who’s in remission of cancer. She also manages to spend a lot of time with her best friend Bobbi, since they are both working together. Once all her day-time duties are over, she loves to hide away into her own bubble and write scripts who rarely leaves the safety of her computer. As much as she loves writing her scripts, the idea of one of them being turned into a movie is a dream she never dared believe in. Jac is a great businesswoman, film producer, and director who debuted in the movie industry with her best friends’ years ago. With time, their short movies turned into amazing successes, which allows Kefran Media Limited to host a Facebook contest to get the best script there is and turn it into a movie. One of Sasha’s script is sent by her best friend and her mom and it catches the attention of Jac and her friends/business partners. Can Sasha handle the pressure of all her dreams about to come true? Andrea Bramhall did more than a fantastic job with her latest novel Lost for Words. Her amazing talent as a storyteller is obvious in this novel even more than in her previous ones. Between the pages of this story lies the secrets of how most amazing romance book should be in my opinion. It was honest, cute, intense at times, some parts were fun, others were harder to read without holding your tears in (but not the angsty kind of tears). I still cannot get over the wide range of emotion this book got out of me. It was a feel good and cry your heart out at the same time kind of story and I enjoyed it more than I could ever explain. I admire how important the non-primary characters are in the story so that even when you are getting involved in Sasha and Jac’s interactions, you still get hilarious moments with Bobbi, Sasha’s best friend and Fleur, her pothead of a mother. I loved that Bramhall doesn’t wait for half the book to get the romance started. It’s great to watch both characters find each other and learn to love, trust and respect one another. The easiness of how their lives merge together was sweet but still a realist possibility. I get bored at times with books when the writer spends more than half of the book getting characters angry at each other and mentioning 100 reasons why they could never be together, just to get them together in the end, luckily this one isn’t the case. A book like this one seems even more realist, maybe a bit over romanced at times for some readers but I still had an amazing time reading it. The title of Andrea Bramhall‘s latest book, “Lost For Words,” is so befitting because I was lost for words after reading it. Brilliant doesn’t even begin to describe how the story had impacted my entire realm of consciousness, my psyche. Devastatingly resonating, achingly memorable, infinitely heartening and emotionally inspirational. Quiet peace. This book is now my favourite Bramhall story as well as one of my all-time favourite lesfic stories (Blimey! 2nd one from the same author? Rare for me!). In my opinion, this book is her best work yet. The writing was so personal, so affective, the story so all-encompassing and transcendent. “Lost for Words” is not your regular romance/love story, where it centres around 2 protagonists. This love story has a larger meaning to it, which involves not only the relationship between Jac and Sasha (the 2 main romantic protagonists) but also between Sasha and her mum, Fleur. And cementing the depths of these two loves, Bramhall gave us the unreserved love of friendship and sense of family in Sophie, Mags (Jac’s best mates and family) and Bobbi (Sasha’s best mate and family, Fleur’s other daughter she never had). These intertwining loves and connections slowly but surely blended together and united as a complete family unit in the end, which Bramhall, imo, weaved so organically it was beautiful, absorbing and poignant to read and experience wholeheartedly. At the first mention of Peter Pan, I was intrigued. Hooked (no pun intended!). I knew then this story would be different, layered, deeper, thought-provoking, impactful and reverberating for me. Because I’d always considered the Peter Pan story to be deeply allegorical, multi-layered, multi-nuanced, multi-interpretative whilst disguised as a children’s literature. Bramhall’s quiet intent of weaving the metaphors of Peter Pan to accentuate the prose of Jac and Sasha, Fleur and Bobbi’s story was utterly riveting, mesmerising, leaving me wanting more as I absorbed every word, devoured every page effortlessly, which ultimately soothed my soul as the story ended where everything came together so perfectly, I couldn’t ask for a more penetratingly satisfying result. Jac, in essence, was Peter Pan. The one who wouldn’t grow up as she jumped from one relationship to another without any sense of love and fulfillment. She just settled, not even contemplating growing out of her emotionally stunted existence, for fear of rejection, abandonment and loneliness. She was okay with “playing” at work doing what she loved and passionate about, and in her personal life “playing” house with her life-size “trophies” with no plans for any future. Then came Sasha, by sheer chance, through winning Jac’s company’s annual scriptwriting competition. Something she didn’t even do it herself! And, her script wasn’t even Jac’s pick in the beginning! It was Sophie’s, Jac’s best mate, who convinced her to pick Sasha’s script in the end. Sidebar: I loved the fact that Sasha’s winning script, “Nightingale,” was actually Bramhall’s own award-winning novel of the same title! I was excited and felt a sense of ownership to the story of “Nightingale” because it was one of me favourites, never forgetting the sheer power and intensity of Bramhall’s writing and storytelling, so I was instantly invested in how it was going to be adapted into a film, with Jac and Sasha at the helm. It was such a surreal feeling as Bramhall depicted all the behind-the-scenes action in making the film with such aplomb, from pre-production, casting, production meetings, script re-writes, rehearsals to actual shooting of the film and finally post-production, i.e. editing, rough cut. I felt like I was part of the production team! The whole experience riding this filming journey in this book was utterly surreal and exhilirating! Loved every bit of it! I’ve always been invested in the in-depth goings-on in the world of film production. It’s like entering into an alternate universe, really. It’s like having a hand in creating a universe. Imagine that, eh? And Bramhall gave me that with this story! Bliss! Also, by using a real novel (Bramhall’s “Nightingale”) as Sasha’s script grounded the whole film adaptation story, somehow, I felt. Perhaps because the story of “Nightingale” actually existed, not just bare-bones, created on the fly to accommodate the filming world that was to be used as the backdrop of the novel. Anyway, back to Jac and Sasha’s game of “chance” – after Sasha’s script was picked as the winner, it struck Jac to the core when she heard Sasha’s voice for the first time! Sasha just so happened to own a kind of voice that Jac went crazy for as long as she could remember – Bonnie Tyler/Elkie Brooks – sultry, husky with a subtle, shaking vibrato. What were the chances, eh?! As if that wasn’t enough, Jac discovered that Sasha, like her, was also a big fan of Peter Pan, carrying its story and layered meanings over to their adulthood, too! To top if off, Jac’s company’s motto was a quote from Peter Pan! I mean, when the stars align, they do align to the nines, don’t they? Bramhall made it delightfully serendipitous with a dash of whimsical but at the same time, real. Because, hey, that’s what we call fate, destiny or serendipity, which happen in life, innit? I was enthralled by Jac and Sasha’s first encounter – phone call. I could literally hear their conversation with Sasha’s voice, the kind which I always LOVED, too, as much as Jac did! So relatable! Loved it! Well done, Bramhall, for vividly describing the voice that I could hear it from the words! From that phone call, I could sense the chemistry between these two destined souls blooming ever so naturally. I was addicted already. Now Sasha, she was another type of Peter Pan, imo. The one who wouldn’t change, settled with her dead-end job, with no love in her life. Her fear of change, failure and guilt in her life was so great that her excuse for remaining stagnant instead of moving forward was because she had to take care of her mum. She was just being a good, devoted, loving daughter. She mistook settling for happiness. It’s amazing how our defence mechanism makes us false martyrs of our own deluded beliefs out of sheer fear, innit? But there was also a little bit of Wendy in Sasha, as far as Jac was concerned, which was prolly one of the reasons Jac was drawn to her. Bear in mind, both of them were already attracted to each other even though none of that was overtly expressed. But because of Jac’s own insecurity, rightly so, as a result of her most unfortunate childhood past, issues of abandonment, trust, the belief that she wasn’t deserving of love and care were her stumbling block to actually finding love and true happiness. She craved it. But she couldn’t find a way through that cloud of uncertainty. Sasha’s best mate, Bobbi, had a little Tinker Bell in her. Loyal, helpful, kind, totally devoted to Sasha (and by extension, Fleur), she was basically family. But she was also extremely jealous, insecure and clingy, always wanted to be close to Sasha, be it in her personal or work life. Basically, Bobbi’s life revolved around Sasha. They were besties. But Bobbi had always been in love with Sasha but Sasha always saw her only as her best mate, her family, nothing more. Yet, Bobbi was still pining for Sasha whilst being her best friend, being there for her and Fleur throughout the years they’d known each other. And it worked well without any problem until Jac appeared in Sasha’s life. So when she realised that her Svengali hold on Sasha was beginning to falter, she got jealous and retaliated. No surprise, there. Jac and Sasha’s growing relationship was further enriched by the presence of the one and only Fleur, Sasha’s very COOL mum. Fleur. I LOVED Fleur. She was a force to be reckoned with. She was the unicorn of this story. That’s all I’m gonna say! She had this irresistible larger-than-life personality, a social butterfly, loved by anyone who crossed her path, the ONLY one who knew how to enjoy her life, knew what life meant. She was the essence of Peter Pan, Tinker Bell, Wendy all put together. She took charge of her own life, enjoyed it and having fun as she desired. Her love for Sasha was unconditional and only wanted her to be happy. Fleur and Sasha were more than mother-and-daughter. They were best friends. I absolutely loved their chemistry, so much fun to read, and so much laughter! They were each other’s support, in every sense. Also worth mentioning, Fleur’s chemistry with Jac was simply delightful, hilarious and touching. They just clicked. Fleur was fearless. She looked into the abyss and sprinkled it with “pixie dust” of her own and had a blast with it. All she wanted there and then was to make sure Sasha take a step forward from her stagnant life, reach for her dreams, and start living instead of merely existing and settling. She wanted to make sure Sasha had someone in her life who’d love her, take care of her. That was her wish. One can’t mention Fleur without all the quirky, hilarious, outrageous happenings whenever she was around! OMG! There were several LOL, hilarious, crazy scenes throughout the book, I was practically cackling non-stop, almost keeled over as I laughed too hard at one time! That was whilst I was reading me favourite hilarious scene – Jac’s first visit to Sasha and Fleur’s house, her first encounter with Fleur. Jac’s witty internal monologue, even outside of this scene, was one of the many things I loved about Jac. But here in this particular scene, her inner thoughts and mad attempt at impressing Fleur just about killed me…with guffawing laughter! Who knew Sasha’s repeated cryptic warning to Jac upon her arrival, “Don’t eat the cakes,” “…you really must stay away from the cakes,” would unleash such hilarity afterwards, eh! Anyway, Bramhall’s spot-on humour in her words, be it in the dialogue or monologue, had me laughing and chuckling all throughout, especially where Fleur was concerned! Let’s just say I won’t be able to look at Vaseline, dentures and potpourri without thinking of Fleur from now on, that’s for sure! As Jac and Sasha became closer, working and spending time together, Jac was still haunted by her sense of worthiness to be loved, to be cared for. That was where Sophie, her best mate, came in. She was Jac’s voice of reason, her rock, the only one (besides her other best mate, Mags) she trusted with her life, Sophie was her family. Sophie reminded and reassured her that Sasha would be the one she could trust, love, be loved by her and she could be vulnerable with Sasha. In comparison, Sasha was more willing to step out and pursue her happiness, despite still having doubts, as love and attachment for Jac grew. I loved how Bramhall deftly crafted their character development and growth equally, showing us how Jac and Sasha dealt with their lives as they went through their own internal struggles and dilemma: Jac with her insecurities, her new experience in having a real relationship that was based on true love as opposed to using relationships to fill the void of loneliness that she always felt, as well as having to deal with her returning ex! And Sasha with her fear and guilt about leaving Fleur alone despite her mum pushing her away to live her dream, enjoy life as she truly desired, not to mention her constant guilt about not spending enough time with Bobbi, feeling guilty about Bobbi’s unrequited love for her when she could only offer her no more than being her best mate, her family. The whole process of Jac and Sasha coming to terms with their deepening connection, realising that in order to achieve what they both craved for – love and happiness – they needed to start living and stop settling, and their ultimate acceptance of their love and trust for each other were utterly captivating to read! I absolutely adored their chemistry – their dialogue and exchanges were funny as well as compelling, their intimacy was brilliantly depicted, so natural, so organic. I believed in their journey of self-discovery. I believed in their love story. If we give ourselves a chance by taking one small step forward, life wills out eventually, doesn’t it? A memorable, hilarious moment I have to mention was the scene where Fleur turned up at the filming of Sasha’s movie! OMG!! Bramhall’s hilarious words literally had me on the floor cackling me arse off! You simply MUST read it to find out just what mischief Fleur was up to!! What a crackin’ly original comedic scene right there! Perfection! As the story reached its final act, something happened that took my breath away. It was written with so much heart, so much emotion, it was soul-penetratingly affecting. But Bramhall never failed to inject a dose of laughter throughout that really made it all the more memorable, with extraordinary depth. I’ll never forget it. How she depicted the raw emotions and unspoken words between Sasha and Fleur, this utterly beautiful relationship between mother-and-daugther, was portrayed with such honesty, sincerity and true openness. I was struck by Fleur’s absolute strength and faith in living her life according to her own path. A path that Sasha finally realised was taken with grace, joy and contentment. Sod the rules. In addition, Fleur always wanted to see Sasha finally living her dream, living the life she was meant to have, finding true love and happiness and Fleur made sure it happened. Fleur clearly had this steadfast belief that “All you need is faith, trust and a little bit of pixie dust.” A Peter Pan quote. How appropriate! Bramhall’s use of J.M. Barrie’s quotes throughout the book was very impactful as they enriched the emotional nuances of the story and character development. One particular quote uttered between Fleur and Sasha will forever be marked indelibly in my mind because the entire dialogue was written with so much tenderness, so much heart, it penetrated my soul. The most unforgettable moment in the book for me had to be Sasha’s profound speech. An overwhelming sense of nostalgia with a brush of melancholy engulfed the deepest recesses of my emotions, thoughts, my sense of being, which ultimately glided into the quiet embrace of blissful peace, as every word came to life for me. I was thinking of me mum all throughout. Fleur’s relentless and unconditional love for Sasha reminded me so much of me mum’s, for me. Thank you, Ms. Bramhall, for your intensely personal, deeply emotional and heartfelt words. Bittersweet is such an understatement but that’s all I have. But I think it fits. I WANT TO BE LIKE FLEUR WHEN I GROW UP!! How Bramhall ended this book was superbly inspirational. The sense of family, love and devotion that the words invoked through the whole gang, even the sodding cat, Nip, as they came together, gave me such joy and hope and a tremendous sense of peace. I was profoundly moved by that scene. It was cathartic. No matter what, this group of interconnected souls would always be there for each other, unconditionally. Brilliant writing, and a thorough understanding of the characters’ emotions and state of mind. And what better way to close out the story than Fleur having the last word, eh? Absolutely genius, imo! Special mention: I absolutely enjoyed every scene between Jac and Sophie. They had so much rapport, I really believed the deep bond Sophie had with Jac. Proves just how skillful Bramhall is with writing dialogue, laced with vividly descriptive emotions and nuances. Sophie and Sasha’s chemistry was so fun to read! Such genuine, realistic words that personify their growing friendship. And Bobbi. Oh, Bobbi. Her genuine love and care for Sasha and Fleur were truly heartwarming. Wait until you read her convo with Jac and then Sasha. I particularly loved Bobbi and Jac’s exchange. It was not clichéd like I expected it to be but, rather, it was a turning point in their relationship, which Bramhall depicted brilliantly in their dialogue. All in all, “Lost For Words” was incredibly poignant, deeply meaningful with so many unwritten but felt layers, and emotionally resonating for me. As well as a brilliantly depicted love story between two Peter Pans who were too scared to grow up to live their lives to the fullest, who, through a sprinkle of pixie dust of fate, destiny and serendipity, met, felt their instant connection, fell in love, learned to trust, care and rely on each other, and finally grew up and became Wendy, conclusively leaving their “Neverland” behind to experience life together, “Lost For Words” was also about another kind of love story – motherly love and unconditional friendship that translated to family love. There’s a life lesson to take away from this book: Life’s too short. Take a chance. A leap of faith. Let go. No fear. Embrace all. In essence, “Keep calm and eat the brownie.” No truer words, really. Why the brownie, you might ask. Well, read the book to get its true meaning and once you do, you’ll agree that it’s so bloody relevant to the moral of this story! Also, laughter is indeed the best medicine! If you want to experience a love story that transcends the traditional formula, an overall story that is utterly multi-layered, richly metaphorical, deeply resonating, emotionally relevant, a story that will make you chuckle, laugh out loud, go bonkers with the absurdity, cry your eyes out, but ultimately fulfill you with an incredibly beautiful journey about love and life, I HIGHLY recommend this book. “Lost For Words” is more than a lesbian romantic comedy, or even dramedy. It’s more. At least for me. My heart was overwhelmingly full after completing the journey of this story when the last word on the final page was tucked away safely in my memory, where I can always retrieve, at any given time, and revisit it with re-reads. The story, I feel, is also an ode to all mothers and daughters out there regardless of DNA. It also celebrates the unconventional family unit that consists of people we love, care about, and trust, unconditionally. Sod biology. Love is love. In essence, “Lost For Words” is a MUST-READ experience. Thank you, Ms. Bramhall, for sharing with us, such an extraordinary journey of love, life, growth, discovery, acceptance and resolution. Thank you for a truly memorable, unforgettable, extraordinary ride! Disclaimer: This is how I interpreted Bramhall’s “Lost For Words.” I felt all the allegorical layers interwoven into the story which led to my own interpretation of how this incredible story made me feel. It could very well be interpreted differently depending on the reader’s state of mind. That’s why this story, imo, is so rich with many nuances that one can interpret it in any which way possible. That’s the beauty of allegorical stories, innit? p.s. Reading this book had invoked Karen Carpenter in me mind for some reason! Her voice, the music of select songs just latched onto Jac, Sasha and Fleur! Weird or whaa?! So had to listen whilst re-reading it, obvs. Wow…talk about another level of emotional enrichment! Mind blown. 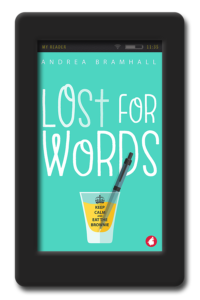 Andrea Bramhall is a brilliant author who has already created some fantastic and award winning books in her writing career, but with her newest book, ‘Lost for Words’ she has reached a new high. I chose to read this book because I had already read several of her other writings , and figured I would enjoy her newest romantic comedy. Little did I realize what an emotional and glorious read this book would be. Yes, it is a romantic comedy, but at the same time it is so much more. Ms. Bramhall doesn’t just pull on your heartstrings with this story. She grabs them and uses them in a tug of war that I can promise you she will win. She will have you laughing loudly one minute and a few pages later reaching for tissues to wipe your tears. The story revolves around Sasha who is living with her mother to help her after she recovers from a medical condition that has left her needing assistance around the house. Sasha is happy and settled in her life as a massage therapist, a shy, self conscious screen writer, and helpful daughter. Her mother Fleur, and best friend Bobbi feel she deserves better in life though, and secretly enter one of her scripts in a writing contest. That one action changes the lives of most of the characters you will meet and come to love . It definitely changes the life of Jac, the co-owner of the movie company that is running the script contest. Bobbi’s life will also be changed as well, and Fleur…well, Fleur is a story all by herself. You have to read this book if for no other reason, to get to know Fleur. I love the fact that Ms. Bramhall has cleverly woven elements of the fairy tale ‘Peter Pan’ into the story. This technique creates an almost magical feel to aspects of the story. You will quickly recognize Jac as Peter, but I will let you figure out the comparison of the remainder of the characters. I give this book my highest recommendation. If I could give it ten stars I would. You must read this book! And Ms. Bramhall, if you are reading this, I have two things to say and ask. Number one, Fleur is Awesome! Number two, could we possibly have a story for Bobbi sometime in the future? Pretty please with a little pixie dust sprinkled on a very special cake? 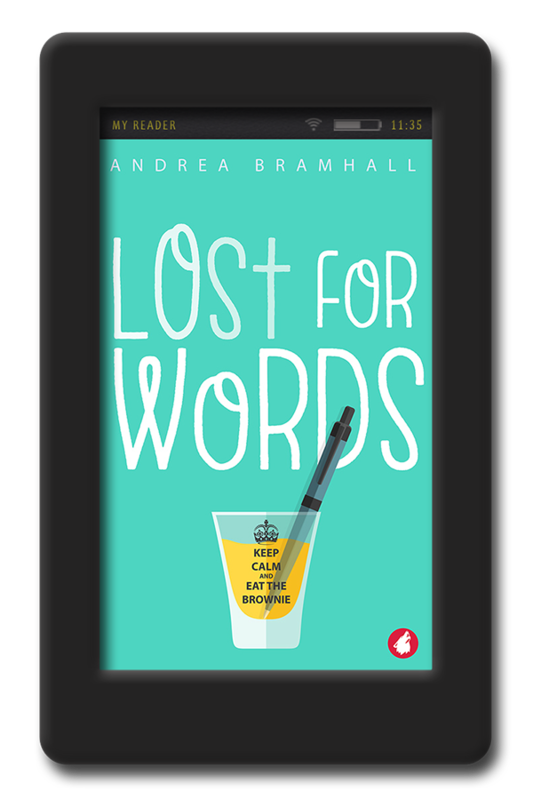 In ‘Lost for Words’ Andrea Bramhall has created a story that had me laughing out loud and nearly choking on my sandwich more than once. There are two scenes in particular that had me in hysterics. But then she flipped it all around and had me in floods of tears. My emotions were all over the place as I laughed and cried with Sasha, Jac, Fleur and Bobbi. Sasha works as a massage therapist and lives with her mum, Fleur. She is stuck in a rut but won’t admit it. When her friend Bobbi secretly enters her into a scriptwriting competition it looks as if her life may just change for the better. Jac runs a media company and is on the lookout for great new pieces of writing to film and promote. She never lets herself get emotionally involved – but will she make an exception for Sasha? This is an exceptional story of two women who find something in each other that completes them. It is funny, romantic, highly emotional and scorchingly hot. The love scenes are off the scale and I’d be wary of reading them in company without a fan to cool you down! But it is the attention to detail and perfect characterisation that really stood out for me. I knew these women. I wanted to know more about them. At one point I felt everything they felt and couldn’t stem the flow of tears. And there in the middle of it all I came across the most beautiful sentences that make me gasp. I loved this book and wish I could give it 10 stars – it’s that good. This book took me through alot of emotions. I loved Fleur, she‘s just unbelievable great. Bobbi seems to be a little too possessive of Sasha, but she’s a very good friend who cares. Andrea Bramhall has done a beautiful job with this book. I usually love reading Bramhall. But this one doesn’t meet her usual standards, In my opinion. Don’t get me wrong it’s a good read but there was just something missing. There are several contradictions which bothered me. Like how do you call yourself a ‘stud’ and apparently never asked anyone on a date in your life. Sorry it bothered me. For me this is a hit or miss and I gave it 4 stars. But I think that it was more for the author than the book. Would I recommend it? Sure. But just keep an open mind. Enjoy!